It’s not new that there is alot of money being made from blogging. People like Linda Ikeji made their fortune online just by blogging. So if you already have some writing skills, you can start a blog part time and build to to a level where by it will keep making you extra money while you still keep your paid employment. What you will do in affiliate marketing is sell other people’s product online and get paid certain commissions based on the sale you referred through you unique affiliate url. There are lot of companies that have affiliate programs here in Nigeria and they pay your affiliate commission directly to your bank account monthly, weekly etc such companies include Konga.com, Jumia, etc. If you can master this art of affiliate marketing very well, you can make alot of extra income while working full time in Nigeria. Alot of Nigerians are making extra money online from Fiverr and i will recommend this for people that have certain skills set already. If you can do graphics design, write programs, write articles, build a website, do a sales video, do SEO etc or if you can just choose any of the skills, look for a mentor and learn. After that set up your gigs and start making extra income online daily. A gig in Fiverr is just like your Store where you can display to your customers exactly what you can do. Once the customer is convinced you can do it, the customer orders your gig. You then work on the gig in your free time and once you delivered, you earn a certain amount. Usually, you earn 80% of the gig amount and Fiverr takes 20% for providing the platform, advertising etc. for example if your gig cost $50, after you delivered you will earn $40 but will have to wait for 14 days for your payments to be cleared. After the 14 days waiting period is over, you can withdraw your earnings. Fiverr is really good way to make extra income while working full time in Nigeria. Selling video course on udemy is also a good way to make extra income for any paid employee. If you have learnt anything that you feel there people that will be interesting in learning about it too, just create a video of you explaining or teaching it, upload to Udemy and set the price. Once you make a sale, you earn an extra income. Don’t be deceived by the numerous videos out there already, some students might just prefer you video course because you teach better or there tips you give that they have not found in other videos before. Just make sure you put a lot of valuable information into your video course. 5. Develop an Android App and sell on google app store. Android App developers make a lot of money especially if the app is good and appeal to a large audience. 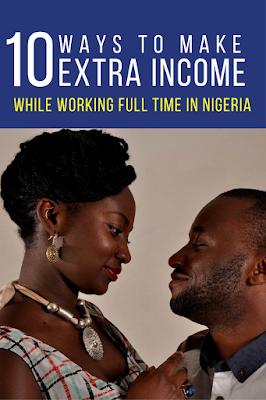 But you have to be very creative to be able to make extra income while working full time in Nigeria with it. You can make extra income from youtube creating videos and attracting audience. Then you monetize the audience. You can make funny videos, news and entertainment videos, how to videos etc to buildup your subscriber base. Once you have a lot of subscribers and your videos are getting lot of views daily, you can then include affiliate link in the video or allow google to place video ads before your video plays and you earn from youtube adsense. This is one of the easiest way to make money online or earn extra income. There are lot of blog owners that needs fresh content daily on the blog or website and are ready to pay to to write for them. So if you are a good writer, you can take advantage of this to make extra money while working full time. You can make extra money online if you know how to predict trends of currencies by trading currency pairs against each other. But this is a risky way to earn extra income unless you know exactly what you are doing. However you can make use of social trading websites like etoro where you can follow other professional traders and copy their trades. Once they make profits on their open trades you also do. Alot of Nigerians are earning real big pay from the mini importation business. People like Patrick Ogidi, Adetunji Gbolagade, Alimi Balogun etc are earning from the mini importation business. If you also want to earn extra income from it, all you have to do to is source for hot product online from website like aliexpress, ebay, amazon etc then look for a good shipping agent or company to purchase and ship the products to you in Nigeria. Once you get the products, you can sell to your colleagues in the Office and else where too. This is a good way to make extra income in Nigeria especially if you have a small capital to start. mlm or Network marketing business model is becoming more and more acceptable worldwide simply because it’s the only business where you can have unlimited income potential. It has also been established from facts that the mlm / network marketing has produces more millions than another profession in the world. whatever you present field, you can get involved with network marketing make make extra money while working fill time in Nigeria. Previous Post Previous Post: How To make Money in Nigeria as a Student. Next Post Next Post: 5 Best Multiple sources of income ideas for Paid Employees.